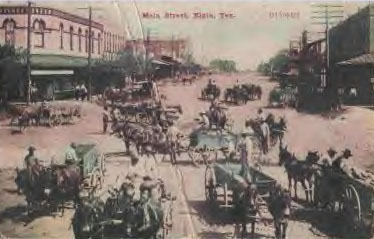 Elgin, Texas was founded in 1872 when the Houston and Texas Central railroad made a stop there. The city is 19 miles east of Austin and considers itself "The Sausage Capital of Texas", through their exporting of almost 3 million pounds of sausage a year. Their web site (http://www.elgintx.com/) states: "Elgin is a part of the Presidential Corridor. The Corridor commemorates the presidencies of two famous Texans, Lyndon B. Johnson and George Bush".